Ennis, MT & Earthquake Lake – Small Town Charm & Airstream Trailers! 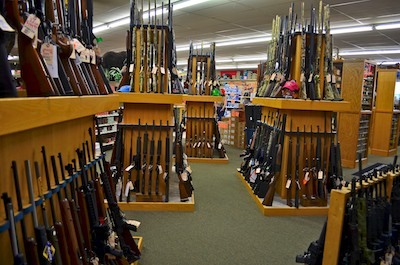 Mid August, 2012 – After leaving Nevada City, MT, we found ourselves buzzing through the small town of Ennis. It was so appealing we just had to stop and look around, and the next thing we knew two days had gone by and we were still in Ennis (population 840!). This is snow country and hunting country and elk and deer country, and there was vivid evidence of this all around town. We had recently discovered that “antler hunting” is a popular pastime when the elk shed their antlers each year, as the crazily shaped horns can be used for all kinds of intriguing home decorations. Sure enough, there was a store in town dedicated to all things Antler. A picket fence in snow country! Hunting is a favorite activity. 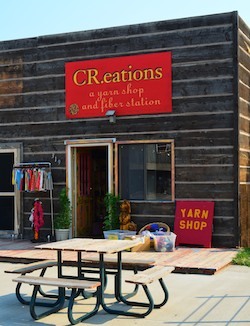 But the little shop that got my interest perked most was CR.eations Yarn Shop, a little boutique store that sold specialty yarns from all kinds of woolly creatures from all over the world. I love knitting and crocheting and have always found something soothing and sensual about the different kinds of yarns you can work with. But my needlework days were back when I was a teenager in the 1970’s, popping off sweaters and afghans to ward off those cold New England winters. It was amazing to see how far yarn has come since then! 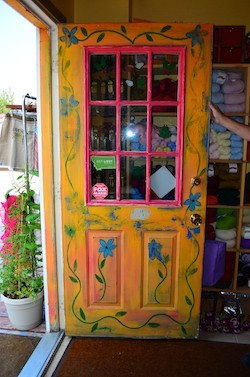 Christine Rodgers is the German-born owner of this shop, and she eagerly showed me her many different wares. She explained in detail how each yarn was processed, what kinds of animals it came from and what kinds of projects it would be best suited for. She took me from shelf to shelf, putting soft fluffy skeins in my hands and describing how the wool had been pulled or twisted to create the yarn. 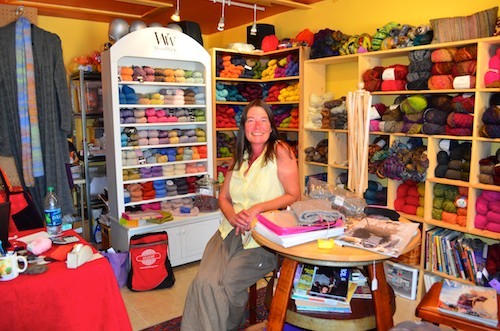 Coarse yarn, silky yarn, thick yarn, thread-like yarn – she has it all. She even demonstrated the use of a primitive spinning wheel like the one the traditional Zapotec Weavers had shown us in Chiapas, Mexico last spring. The woolly animals responsible for Christine’s lovely yarns are raised on special farms, but some other furry creatures entertained us right outside the buggy that afternoon. We got a much needed deluge of rain, and a horse that had been quietly munching grass in the pasture behind our trailer suddenly went berserk, rolling around in the wet grass in a show of unbounded joy. 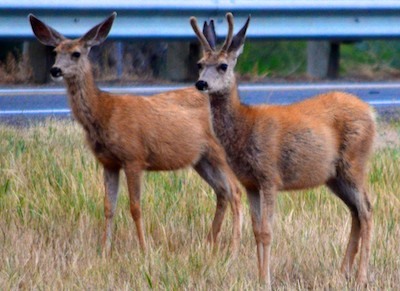 Just as we were laughing about his crazy behavior a group of deer joined in the sport and soon they were all rubbing their backs in the grass and kicking their legs in the air in glee. The small herd of deer hung around quite a bit, and the next morning they wandered past our trailer several times on their way to and from the nearby woods. We finally tore ourselves away from Ennis and journeyed south towards Earthquake Lake. 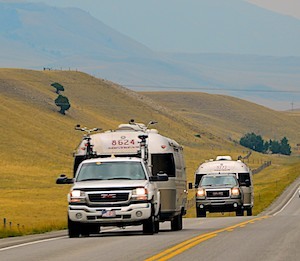 We always take note when we see other RVs on the road, but this morning was special: at least twenty or thirty Airstream trailers passed us going in the opposite direction. It’s uncommon to see just three or four Airstreams in one day, so after the first half-dozen went by we knew something was up. 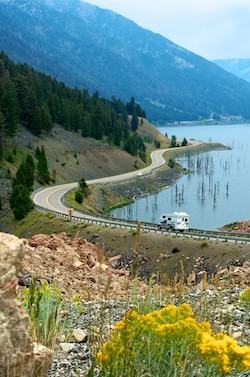 Sure enough, when we got to the Earthquake Lake rest area we poked our heads in on a couple in an Airstream and found out we were crossing paths with an Airstream Caravan, an organized 52-day rally of twenty-five trailers that was following Lewis & Clark’s journey. On this particular day they were coming from Yellowstone in Wyoming and going to Dillon, Montana, but their overall route went across the country, following the explorers’ path. What a fun way to spend a summer! 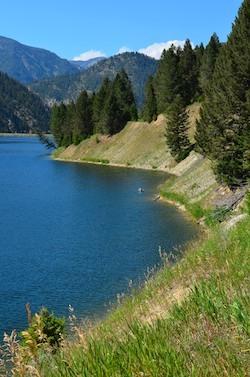 We hung around Earthquake Lake for a while and learned a bit of its intriguing history. We hadn’t known that on the fateful night of August 17, 1959, there was a 7.5 earthquake right there in the Madison RIver Canyon. In just moments the earth’s crust plunged 19 feet, submerging the north shore of Hebgen Lake (along with all its shoreside cabins) and thrusting the south shore upwards. The lake became a giant, rocking bathtub, with water sloshing back and forth and over the dam. 28 lives were lost and hundreds of vacationers were trapped as portions of the highway slid underwater. What a mess. But today Earthquake Lake is beautiful and tranquil and you can’t even see a hint of the fiery forces beneath the earth’s surface that created such chaos above. These were our final days in Montana, and it was sad to say goodbye to a state that had taught us so much history and shown us so much beautiful scenery over the past month. 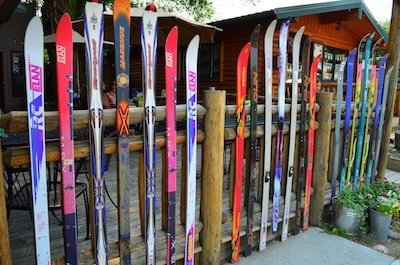 But the lure of the stunning Grand Teton National Park tantalized us and drew us south to Jackson, Wyoming. This entry was posted in Montana and tagged Montana, Travel, USA, WP Travel by Roads Less Traveled. Bookmark the permalink.